We are a known provider of Fully Automatic Coller Type Form Fill and Seal Machines that cater to various industries. These machines find usage in the food & beverage industry for packing tomato ketchup, mayonnaise, cheese spread and other highly viscous products. With the aid of our machines, these products can be packed in 1/2 kg And 1 kg packing in LDPE pouches. Established in the year 1996, our organization has been engaged in offering a wide range of industrial supplies. Following our legacy, we have been successful in attaining a reputed position as an eminent manufacturer, supplier and exporter of Industrial Packaging Machines & offering Packaging Solutions too. 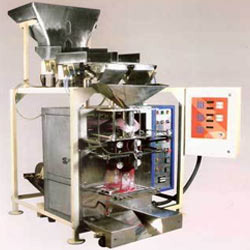 Our clients can avail from us an innovative range of Packaging Machinery, Fully Automatic Collar Type Machines, Flow Wrap Machines, Collar Type Volumetric Cup Filling Machines, Holographic Embossing Machines, Flow Wrap Machines For Biscuits, Spout Flexi Tube Machines, Pouch Packaging Machines, Zipper Pouch Packaging Machines, Powder Packaging Machines, Multi Track Liquid Packaging Machines, Form Fill & Seal Packing Machines, Collar Type Form Fill And Seal Machines, Automatic Form Fill & Seal Packing Machines, Zipper & Standy Sachet Making Machines, Multirack Form Fill Seal Machines, Multirack Form Fill Seal Machines For Liquor, Liquor Packaging Machines. These robust and rugged constructed machines are manufactured in accordance to the guidelines of ISO standards with the use of quality assured raw material and premium grade components. The CAD/CAM facility in our unit enables us to manufacture these machines as per the detailed specifications of each client. Furthermore, our fully equipped quality control department facilitates in proper inspection of each machine to ensure flawless products are delivered to the clients. Our capability to process bulk orders has helped us in associating ourselves with renowned clients like Ajanta Products Limited, Cremica Foods, Packotech Industries, Asian-afro Business Company, Ponu Monu Supplies Limited, Nevla Tobacco and Fast Track Private Limited, to name a few. Our clients are located in the different parts of Indian Subcontinent, East Asia, Middle East Africa and South East Asia. We are looking queries from Nigeria, Kenya, Uganda, Ethiopia, Ghana, Nairobi, Sri Lanka, Indonesia & Dubai.